German tourism group TUI has seen its annual profits boosted thanks to a good performance at the Hapag Lloyd shipping container business. The unit contributed 150m euros (£127m; $202m) to TUI's profit compared with a loss of 174m euros a year before. TUI sold about 57% of Hapag last year, and it now aims to sell its remaining 43% stake to focus mainly on tourism. It has asked Credit Suisse, Goldman Sachs and Greenhill to prepare an initial public offering of Hapag. 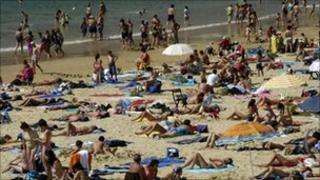 TUI also said it had high hopes for the current financial year as customers took more holidays. "Trading for the current winter season is up year-on-year in all European source markets, with some markets reporting substantial growth," said TUI chief executive Michael Frenzel. Added to the good performance at Hapag Lloyd he said that meant TUI now had "resources and options available that we would hardly have considered possible a year ago". TUI reported underlying earnings of 589.2m euros for the 12 months to the end of September, against 470.5m last year. Turnover dropped by 1.5% to 16.35bn euros, after European flights in April were hit by the Icelandic ash cloud. Net profit fell by 40% to 101.8m on the year before, but the previous figures had been boosted by the sale of the 57% Hapag Lloyd stake.